Can the IEA really be expected to be objective? I tried to look at this issue two years ago, when the World Energy Outlook 2008 was released. The organization of the IEA, its close ties to the OECD, and the significant funding of the IEA by the US gave me real doubts about its ability to be objective at the time of my analysis. I doubt the situation has changed a great deal in the last two years. Below the fold is the post I wrote two years about this issue. The International Energy Agency (IEA) acts as energy policy advisor to 28 member countries in their effort to ensure reliable, affordable and clean energy for their citizens. Founded during the oil crisis of 1973-74, the IEA’s initial role was to co-ordinate measures in times of oil supply emergencies. As energy markets have changed, so has the IEA. Its mandate has broadened to incorporate the “Three E’s” of balanced energy policy making: energy security, economic development and environmental protection. Current work focuses on climate change policies, market reform, energy technology collaboration and outreach to the rest of the world, especially major consumers and producers of energy like China, India, Russia and the OPEC countries. With a staff of around 190, mainly energy experts and statisticians from its 28 member countries, the IEA conducts a broad programme of energy research, data compilation, publications and public dissemination of the latest energy policy analysis and recommendations on good practices. If the IEA acts as policy advisor, it is clearly involved in many matters of political importance. One question a person might ask is whether the IEA is able to separate its political role from its data analysis role. Is there an energy policy Chinese Wall? Also, there are many other tugs on anyone who provides forecasts to others (consistency with past forecasts, explainable changes due to outside causes, forecasts in line with what the clients want). Given these issues, one might ask whether the IEA can really be expected to be objective. Is there any auditor looking over the IEA's shoulder? Is there any other outside independent agency looking out for the accuracy of the forecasts? The Organisation for Economic Co-operation and Development (OECD) is an organization of 30 countries, based in Paris, that was formed in 1961. It is a large organization, with 2,500 employees. The 30 countries in the OECD are counties which are economically developed, and thus have the highest per-capita use of petroleum products. The OECD might be thought of as the "organization of petroleum importing countries". The IEA is a (supposedly) independent agency of the OECD. The countries making up the IEA seem to be slightly different from those of the OECD, but this could just be a matter of different dates--membership changes a bit from year to year. The IEA makes a point of its independence, while the OECD considers the IEA to be one of the ways it achieves its objectives, so one might suspect there is some internal tug of war. The IEA is much smaller than the OECD, with only 190 employees. This seems to be up considerably from the recent past, when it only had 160 employees. The IEA and OECD are both located in Paris, and seem to have some co-ordinated activities. For example, this job vacancies list is for both the IEA and OECD. Also, the copyright on the new IEA World Energy Outlook 2008 is "OECD/IEA". (vi) promotion of co-operative relations with oil producing countries and with other oil consuming countries, particularly those of the developing world. These goals were fairly limited, so there was little chance of conflict between data gathering and policy setting. Over the years, the goals have broadened, adding much more of a chance for conflict. (i) co-operation among IEA participating countries to reduce excessive dependence on oil through energy conservation, development of alternative energy sources, and energy research and development. One area where the IEA objectives have grown is in response to climate change concerns. The IEA now plays a leading role in attempting to reduce CO2 emissions. According to its web site, the IEA has formulated a plan for reducing global CO2 emissions by 8.2 gigatonnes by 2030. As part of its climate change efforts, the IEA has initiatives in the following areas: alternative energy; energy efficiency in buildings, appliances, transport and industry; cleaner fossil fuels; carbon capture and storage; renewable energy; and enhanced international co-operation. IEA objectives have also grown in recognition of the fact that the world has changed since the time when the IEA was formed in 1974. When the IEA was founded, OECD countries accounted for nearly all of the oil demand. In recent years, China, India, and many other lesser developed countries have increased their oil use. These changes have altered the focus of the IEA toward more of a world-wide view. With more of a world-wide focus, the IEA has shifted toward more of a general growth objective, similar to the growth objective of the OECD organization. Readers of this website know that economic growth and a long-term declining resource base are inherently in conflict, because it is not possible to have economic growth without sufficient energy resources. This has the potential to create conflict within the agency - cognitive dissonance written large. One can surmise that when economic growth was first added as an objective, no conflict was apparent, because there seemed to be plenty of oil for everyone and new energy sources (natural gas, nuclear, and other resources on the horizon). Now that resources are tighter, this fundamental conflict is starting to be manifest. Environmental protection is now a major area of IEA's operations, but a review of the web site would suggest that the issues of concern are almost exclusively issues related to CO2 and climate change. Issues such as the shortages of fresh water and pollution do not appear to be a significant part of environmental protection. Forecasts of future CO2 levels and future temperature levels are, in effect, an evaluation of whether IEA's decision to focus on CO2 levels and global warming was the correct one. While this may not bias IEA's thinking, many organizations in this position would tend to prepare reports that paint an unnecessarily gloomy picture of likely future global warming, thus validating their prior decision to focus on this problem. Even engagement worldwide makes the IEA more vulnerable to conflict that when it began in 1974. When the IEA was just co-ordinating response to inadequate oil supply, the issues it dealt with were fairly limited. Now that there are many more users of its reports, including many non-OECD countries around the world, the IEA can come under pressure to make forecasts come out in the way these users would like to see them. Also, data quality related to these new users is likely less good. Here again, we have potential for conflicts. Now that data is required from around the world, the IEA must obtain data from a wide variety of sources. It is nearly impossible to question the accuracy of information provided in good faith. As oil-producing companies and countries are pressured to "look good", there is increasing possibility of data of dubious quality being submitted. The IEA can do its best on quality control, but it is not clear that even these efforts will prove successful, whether with 190 employees, or 1,900. The IEA has discretion in choosing who else to obtain data from. Besides data from individual countries, the IEA seems to put a great deal of reliance on data from IHS. The company IHS owns Cambridge Energy Research Associates (CERA), an organization that consuls for energy companies. CERA is known for its forecasts showing oil production continuing for many years without decline. IHS may be the best source of data available, but is it, in turn truly unbiased? Because of the way the objectives of the IEA have been established, the same organization collects data, analyzes it, and makes policy. This combination of objectives sets the situation up for conflict. Furthermore, once a policy has been set, it might be difficult for the IEA (or any other organization with conflicting goals) to produce a forecast that indicates that the previous policy decisions were wrong. If previous forecasts were wrong, or need to be changed, it is convenient to have some outside event that the changed forecasts can be blamed on. Global warming fits conveniently here. So does lack of investment by countries outside the OECD. It seems like it would be difficult to get much accomplished in such an arrangement, with so many bosses to please. Who Pays? Who has the most votes? 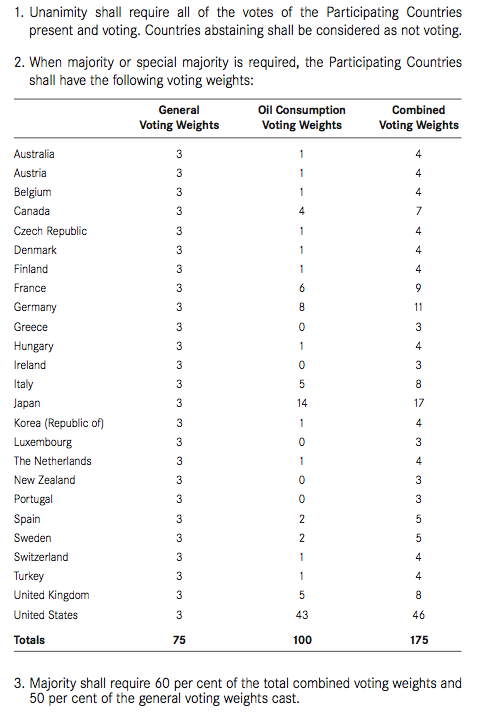 Clearly the US has the biggest share of the votes (about 26%), and Japan is second. All of the other countries are much smaller. The US plus Japan pay 49% of the assessments, so one would suspect that if there is anything that the two of those countries object to, there could be some leverage brought to bear on the agency. 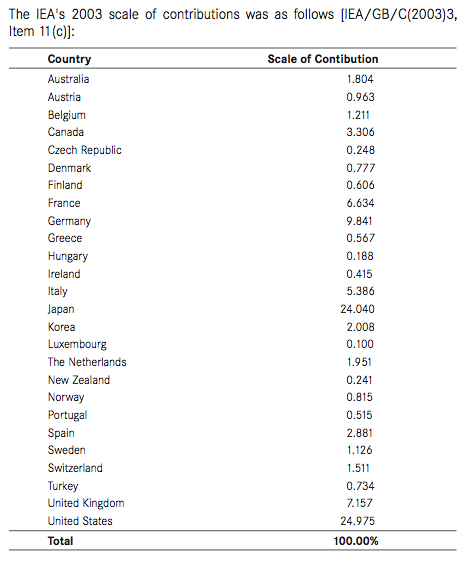 In order to make up for the deficient funding, some countries offered voluntary contributions. These grew over the time period in question. 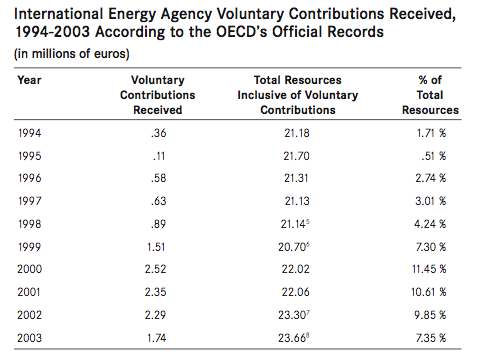 To the extent that the agency became dependent on these voluntary contributions, one might think that the countries making these contributions (whoever they were) might have been able to exert leverage with respect to issues of interest to those countries. Funding for the IEA has probably increased somewhat since 2003, because the number of employees of the agency seems to have increased from 160 to 190. There has also been an increased emphasis on climate change. It is possible that the additional employees and costs related to the beefed up climate change aspects of the IEA. When I looked through the history document from which I took the budget and other exhibits, I could only find a few mentions of audits. Basically, there is an audit of funds spent, to see that they are spent for the intended purposes. 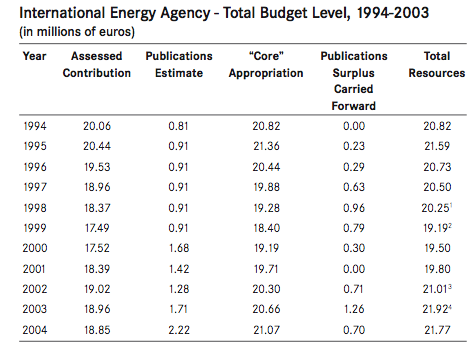 In 1995, the OECD did an operational audit of the IEA, looking at the operations in detail. The fact that it could do such an audit would suggest that it has oversight over the IEA. The only other mentions of audits are in terms of those providing voluntary funding not being able to audit what the IEA is doing with their funds. Who Is Depending On and Reviewing IEA's Numbers? Clearly, all of the 28 countries belonging to the IEA are depending on the IEA's forecasts. Since its focus is worldwide, many of the lesser-developed countries are looking at these forecasts as well. In addition, the OECD is using the IEA's forecasts in its policy making, and the IEA is using its forecasts in its policy making. Many of the bigger countries have their own data and forecasting arms. The US EIA is well known to most of us. Japan has the Institute of Energy Economics, which most of us are less familiar with. The US EIA has in the past published high estimates of future oil production. One would think that this would put pressure on the IEA to be consistent with what the EIA is forecasting, especially since the US is a major contributor to IEA funding. The fact that the IEA has been willing to step out and make statements regarding oil depletion being an issue, when EIA has not be willing to make a similar statement, shows that the IEA is making a courageous (and more risky) effort to be objective, even if one might argue with the precise selection of the forecasted amounts. Regarding who is reviewing the forecasts of the IEA for reasonableness, it is very difficult for anyone to review energy forecasts, so it is not clear if the OECD, or any other organization, could audit IEA's forecasts for accuracy if they wanted to. Data is often not very reliable. Many oil producers who could provide data are unwilling to disclose accurate estimates. The issue is also very complex, and because of this, there aren't many with sufficient technical expertise to review the accuracy of the forecasts if they chose to. But the data and conclusions presented by the IEA is much more important to the world's social system than quarterly reports by the likes of Microsoft, Caterpillar, and Exxon (and Enron), yet data and statements by these public companies must undergo scrutiny by outside auditors. Is IEA information either above the law, or not important enough to warrant outside scrutiny? At this point, The Oil Drum and a few members of various Association for the Study of Peak Oil (ASPO) organizations seem to be the only ones reviewing IEA's analysis in detail. Given the current structure and objectives of the IEA, it seems like it would be very difficult for the IEA to be 100% objective, especially in making forecasts where there is a high degree of uncertainty. The objectives of IEA, and of its more-or-less parent OECD, are not consistent with declining energy availability, and declining growth. So in this context, Mssrs. Tanaka and Birol face considerable challenges. The voting and funding structure are heavily weighted to the US and Japan. If either of them object to a particular view, it would seem more than possible to have this view not approved, or at least watered down. Also, with the complex governance structure, it would seem as though getting anything passed which potentially is in conflict with the views of some of the member nations would be an issue. Consistency with past reports is something that any forecasting agency would consider important. This, by itself, will tend to inhibit big changes in forecasts. When one couples this issue with other issues of importance--such as the perceived need to maintain growth, and a concern about not causing panic, there would seem to be considerable pressure to keep forecasts as close to those in the past as possible. We would note, however, that the IEA has taken steps to indicate that there is a problem, even when other agencies have sidestepped this issue. In fact, the headline projections from this report are indeed a large departure from the recent past. There really aren't other organizations, (other than previously mentioned), that are looking at the IEA report from a point of reasonableness of the forecasts compared to the indications of the underlying data. What would be the incentive? The Energy Information Agency could at least in theory, undertake this role, but it has at least an equally bad track record in forecasting. Theoretically, newspapers could be doing this, but they lack the staff and expertise to manage the technical details. This leaves The Oil Drum and the ASPO organizations as the only "watch dogs" of the supposed "watch dog" agency. Good and timely post Gail. People generally do what they think is best for their continued well paid employment. It's probably a cushy, easy job that no one on their staff wants to risk by offering up more sobering projections. They know if questions arise from their inaccurate projections, they can simply blame something, like regional conflicts, or higher costs of drilling, or the low price of NG reducing drilling, etc. Meanwhile, they are on easy street - why rock the boat? A good example of the diminishing returns of complexity. One part time volunteer analyst on TOD produces far more accurate and useful information than 190 full time IEA employees. See the 1st 2 comments about how if you are making money from someone you tell 'em what they wanna hear. Isn't that practically the epitome of an oxymoron? Very nice overview of the IEA and its workings. I think the concern you've expressed about its ability to be objective is well-founded, for the reasons indicated. I don't know if there's a readily available fix for this sort of thing, as it is an inherent problem for governmental and quasi-governmental organizations in general. One has to look no further than the dubious economic statistics put forth by the US Dept. of Commerce, and the labor statistics put forth by the Bureau of Labor Statistics. Both have an unwritten mandate to not sound the alarm too loudly, not present too much bad news, and (most important of all) not make the administration in power look bad. The problem is rather subtle, in that one seldom gets outright lies, but rather skewed and selective data, biased interpretation of that data, and preconceived conclusions for which the selected data are intended to support. It's really just human nature at work. One does not get ahead by displeasing one's boss or by creating embarrassment for the parties funding your organization. Nor can one count on the mainstream media to serve as a watchdog (as was once the case), as their role has to a large extend been reduced to being a public relations arm of the governments. The only advice one can give in this situation is: don't trust government-generated statistics, be skeptical, and draw your own conclusions from what legitimate data is available. We again get back to some wisdom from Mark Twain: "You tell whar a man gits his corn pone, en I'll tell you what is 'pinions is." In respect to your 12:19 reply to Gail-this is as good a short description of the problems involved of relying on statistics and other data compiled by govt or quasi govt organizations as I have ever seen. Of course it also applies to a greater or lesser extent to the output of any organization. It is perfectly obvious to me and probably ninety five percent of the members who regularly make comments that the IEA is a mouthpiece of tptb and that it is only now at the last possible minute trying to adjust it's output so as to preserve some semblence of respectability-not that this really matters to the personell there, all of them are like lawyers, well paid to parrot the client's line, and all of them more than likely well positioned to move on to another similar job or retire well heeled. My point is this-most of us, nearly all of us, here in this forum, see thru THIS particular farce;or at least, we THINK we do.It is after all POSSIBLE, although EXTREMELY unlikely imo, that the cornucopians are right, or perhaps we are right but possibly we are a decade or two ahead of our time, so to speak-this is still imo VERY unlikely, but well within the realm of possibility. Bear with me, I'll eventually get to my point. Now most of us while frustrated by the fact that nearly everybody out there in the big wide world of the unwashed , ignorant , superstitious fox fooled gop leaning citizenry more or less continues to believe in the grand bau scenario , we do understand why this is so. We understand why the chairman of the local school board or local mayor or our own doctor or attorney or dentist or accountant continues to believe in bau-whether he is a very liberal democrat or a redneck conservative-it's simple enough.While such people, at both ends of the political spectrum are often OTHERWISE very well educated, they are simply IGNORANT of the realities of chemistry, physics, geology, and biology-or else they have never had the liesure to follow thru on what they know and come to thier own conclusions.I for instance know a couple of science teachers who while environmentally conscious liberals, are firm believers in bau-democratic style, which in the end unfortunately is not altogether THAT different from republican style bau.Both still posit eternal growth, etc. Now what I am trying to do here is to get the readership to try to expand upon the concept of the bird's eye view-a bird sitting in the top of a tree in a forest can see a lot of trees but only a bit of the forest;a bird flying a hundred yards up can't see much detail of individual trees but can see a good bit of the forest.An eagle sailing at ten thousand feet can see perhaps most of any given forest -as well as a lot of detail due to the eagle eye of course. Most of the regulars here have achieved a bird's eye view, and quite a few of us have backed far enough away from the trees to see the forest more or less in its entirity. But is it not the case that all of us are closely related to many people who don't have a clue-and that we know and work with many times more such clueless people?People who are often quite well educated in the conventional sense of the word?People whose eyes glaze over at the mention of peal oil, unpayable debts, and so forth? Now I would ask that you consider this- such people comprise the larger part by far of the electorate-and most of them have- by a process that seems quite reasonable to them reasonable to them-come to the conclusion about climate change similar to our apparent consensus conclusion about the reliability of IEA forecasts. They simply don't trust the messenger, having concluded right or wrong, that the messenger is for one reason or another if not lying outright then at least deliberately slanting the message. Please note that I am NOT saying they are right in rejecting the climate change message, as I have frequently posted in the past that I myself believe in climate change in general, and warming in particular, both attributable to some unknown but certainly major extent to human activities such as burning fossil fuels. Now there is like it or not some room for doubt and debate in such issues, and those who believe differently have some sound reasons for doing so;for instance one acquaintance of mine believes that cap and trade is nothing more than another scam organized by a banking/environmental/ bueracratic regulatory monster similar to the military industrial complex.Since I have seen estimates here on TOD, posted by well respected members, that as much as two thirds of the money will be raked off by the banks and traders and regulatory buearacracies,I must admit that I can see his point all too well-which is why I support a straight up carbon tax, which would be less subject to gaming. My point is this; nobody has a monopoly on the truth. We who believe in peak oil and climate change are imo beyond any reasonable doubt correct in so believing. But we are believers only because circumstance and fortune, the fickle finger of fate if you will, has lead us to lead lives where the requisite knowledge has come into our possession. Casting aspersions on the rest of the citizenry who lack this knowledge is the worst possible way to deal with the problem of enlightening them and helping them to learn the real score.Insulting someone and then in the next breath asking or expecting them to abandon long and honestly held beliefs and opinions is simply insane. In the relatively near future I intend to start a site wherein the science is welcome but the commentary is handled in a more politically even handed fashion-after a year of trying to interest my socially and culturally conservative friends and acquaintances to follow this site, not a one of them has become a regular since the they happen to believe , rightly or wrongly, that Reagen was a good president , that Clinton balanced the budget because a conservative congress and citizenry left him no choice, that liberals get a free ride in the msm media, that fast growth based on bubbles is fine if a democrat is in office( Clinton got the credit for Reagen being right that growth could outrun spending), that conservatives/republicans are exclusively blamed for policies passed into practice with plenty of help by liberals/democrats, etc. Whether these people are right or wrong is not the immediate issue-whether they have a place to discuss peak oil, climate change, trade policy, and so forth not dominated by vested interest right wing powers that be is the thing I am concerned with at the moment;they will only consider the evidence if it is presented in such a way that the cultural message is neutral or favorable to thier world view. I do not expect to gain a large audience, but I do expect it to be a very well informed and realistic audience and a site worth reading for its content and objectivity. I certainly will be looking for contributions from some of the regulars here and I expect to link to many articles posted on TOD , the Energy Bulletin, etc, and use them as a junmping off point for further discussion of possible political , technical, and economic solutions to our problems. For instance the recent fine piece on the supposed death of suburbia was great, so far as it went, but there was little discussion of the time frame involved over which changes could take place, and little consideration given to the fact that in times of great change and stress both cultural and regulatory norms can shift in dramatic fashion. In the meantime I urge the audience here to seriously consider the possibility that the environmental message is apt to be better recieved by any middle of the road or conservative types-who just happen to out number you at the polls-if the comments are kept a little more civil.Personally I have a very thick skin and enjoy a little mud wrestling from time to time but I believe I have contributed about as much as I have to say to this audience, at least insofar as the regulars are concerned. I will continue to read it often , as it is a great source of new data and insights, but after a year the basic message is clear-it's time to move on, but I will still be dropping in from time to time. You will be missed if you leave (at least by me). I've often found it a convenient shortcut to the large picture to simply read your posts. Thanks, and let us know the link to a new site if you get it started. Well, I for one are going to miss your well-thought-out and entertaining comments that clearly reflect a great deal of practical experience in the real world. I'd also be interested in knowing more about this website you intend to start. I do think that you bring out a very good point: while TOD contributors and commentator for the most part exhibit a level of knowledge and intellect far above that of the average website, there sometimes tend to be an attitude of 'we are the keepers of received wisdom' that sometimes bleeds through and can easily be interpreted as intellectual smugness. Blatant doomerism doesn't help, either. This can be a turnoff to many people, particularly those who would rather remain comfortably ignorant of things they should not be. For example, I have a very old friend who is an engineer and a very bright guy (albeit not very curious about much), plus I also have a cousin who is a retired vice president of a major company. Both have great faith in BAU, and neither is the least bit interested in the subject of peak oil. I know they would dismiss TOD as just another alarmist, doomer website for which they would have no interest in wasting time even briefly looking at. How to capture the attention of people like this is the question. One thing I know for sure is that they have to be gently coaxed into arriving at their own conclusions and cannot be bludgeoned into becoming a believer. So, I think you are on to something here. Perhaps I might even be able to contribute to your website from time to time. The science is obvious. There is no new oil being made. The existing oil has been hunted for 100 years. It's going to run out. The time-frame and slope of the peak-oil event is of great practical interest to those who become convinced of the eventuality of running out: "When do I have to change my operational view of the future?" The very information that such predictions are based on is clouded through human foibles. Too, the economic system may produce the same effects on another timing and slope, adding another degree of freedom to this problem. It is a human problem. One's personal perception of the future resulting can only be a reflection of their estimate of the human condition. If you are early, you are a fool. If you are late, you are fodder. Perhaps there is a magic breakthrough. Maybe the horse knows the way. What is a human, innately? http://archive.kpfk.org/parchive/mp3/kpfk_101110_170004dbriefing.MP3 This is a download. At 21:38 an interview about willful ignorance. Climate change is mentioned specifically. Nice to hear from you oldfarmermac. As a voice from, and perhaps somewhat on behalf of, the unwashed masses, :) I can tell you that the journey to understanding 'PO' for someone from entirely outside the industry is not a particularly easy one. I wont burn the readers' time by describing my experience now. What I did want to say as a voice from the unwashed, is how much I do appreciate the intelligent and robust argument, thought and contributions of TOD members and the TOD forum team, including all of your posts OFM. Hey, OFM feel free to send a link to your new site to my posted email. Hey OFM, I also have enjoyed your posts and would love to see the site you are aiming to develop. The oil drum used to be like that years ago and I loved the fact it was relatively apolitical, but as is to be expected hard nosed posters, primarily from the left, attacking individuals , primarily from the right, got my hackles up on more than one occasion, mostly because that is not what the site was for. I even got sucked in to making a couple of regrettable posts myself. I am sure we have lost some good contributors as a result of that tilting.. It would be great to get back to the bare science again. The problem is not a political one, and there is no side which can claim to be the most knowledgeable. Why can't we leave the political crap out of the discussion? 1. The world is a game of winners and losers. 2. I am special and therefore I "deserve" to be a winner. 3e. --Oh dear, have I left anything off the list? Who cares? The losers will never realize it anyway and besides, they don't deserve to know the truth or they are genetically inferior and therefore incapable of knowing the truth. Best to feed them with Dancing TV Stars and the like. Now I get to post a link to a TPTB map. If you pay someone - then you don't have to become an IT guru to run the site. You'll have to spend time filtering out the link spammers - if the site becomes popular it'll be a "full time" "job". The Bureau of Labor Statistics is fundamentally honest and nonpolitical. I have been looking at their numbers since 1963 and have not noticed any change in the nonpolitisization of the Bureau as Republicans have succeded Democrats and vice versa. One problem they have is budget: They need more staffing to do a better job than they do now, and there is no interest group (except economists) to support more taxpayer dollars going to BLS. For many of the statistics they publish you practically have to be at least a graduate student in economics to fully understand them. For example, it is easy to misinterpret their headline number on the % unemployed. You have to go far beyond that number to understand what is going on with employment and unemployment, but they do provide them. Their statistics are generally good, though of course there are sampling errors, errors in seasonal adjustments, and other miscellaneous errors. Usually these errors make no difference, however, because they tend to be small ones. Don, the fraud perpetrated by the (aptly named) BLS has been widely documented. The key to your lack of understanding is quite simple: you believe Dems and Repubs have a different fundamental agenda, and that this would show up in stats generated under them. Absent those differences, the BLS must be honest. But it is your underlying, unexamined assumption which is inaccurate. In fact, Democrats and Republicans have precisely the same agenda when it comes to BLS stats. Overall, despite rhetorical and minor practical differences, their agenda is identical: grow State power. True, they each wish to use this power on behalf of a different coalition of stakeholders, but the overarching goal is the same. The BLS is an organ - like the Ministry of Truth in Orwell's 1984 - which serves that purpose regardless of which faction of the political class happens to be on top that year. This is why you never hear Dems or Repubs challenging CPI numbers, or GDP numbers, of unemployment numbers. These are effectively holy writ to the political class - one of the mechanisms they use to enhance their own power. All are fraudulent. All are part of the package of propaganda we've been spoon fed for decades and decades. Chris Martensen did a decent job on this whole issue in the chapter of his Crash Course titled 'fuzzy numbers.' I don't think he went into the BLS's Birth/Death model, which is a blatant joke. Mish Shedlock has documented that aspect of the fraud quite thoroughly. Also, John Williams ay ShadowStats.com has done a fantastic job demonstrating the fraud inherent in virtually all govt stats aka propaganda numbers. None of the people you mention in your last paragraph are economists. Economists--and really nobody except economists--have the education to estimate the validity and accuracy of government statistics. I'm not saying fudging has never happened: What has happened in the past is that fudging is quickly recognized as such and widely denounced. I trust government statistics from BLS and NBER much more than I do the highly dubious numbers coming from CERA, the IEA, and the EIA. I don't trust the numbers from petroleum exploration geologists at all. There would be hidden messages in the report. Those working for the report must somehow cover their backside. He said during a lecture at Sydney Uni in March this year that global warming will become so bad during the next decade that everyone will agree to phase out coal. There is IEA staff who try to ring the warning bell on peak oil. This slide show was from the editor of the Monthly Oil Market Report, Klaus Rehaag. He entitled his 2004 presentation "Is the world facing a 3rd oil shock?" Does anyone know what happened to Klaus? Gail, excellent collection and analysis of the data. While many TOD regulars have been aware of a number of these points, having a clear overview and analysis of this topic helps the newer members understand TOD's mission with greater clarity. Have you considered doing something similar concerning the EIA, building on previous TOD articles on this subject? If not, please give some consideration to doing so as time allows. What does "objective" mean? See for example Energy Technology Perspectives 2010. It offers an analysis of current energy production by technology, a BAU scenario going out to 2050, and a scenario that deeply curtails carbon emissions through the adoption of several technologies. Since the adoption of the technologies depends heavily on decisions that policymakers have not yet taken, (as well as a few technological miracles), the actual future trajectory of oil consumption is unpredictable on an objective basis. A more focused question would be, "Does the IEA outlook take into account the geological, technical and business limitation on the discovery, development and production of oil supply?" Here the answer is probably "no" for the higher consumption case, but it is close for the case where carbon emissions are limited. The relationship between hydrocarbon energy production and climate is being used to persuade politicians to change course without directly confronting them with the limitations on oil and coal production. Is is sort of like what was done by relating thermonuclear war and climate. Everyone understood that a thermonuclear exchange was a bad thing, but the analysis which showed that an exchange would wipe out agriculture through nuclear winter led to serious discussion of nuclear disarmament. AGW is being used much the same way to convince political leaders that the current energy policy is unsustainable and that econmic systems must be changed to a much lower use of hydrocarbons. Unfortunately the cause and effect relationship between hydrocarbon burning and the negative effects of AGW is not as clear cut as between a 20,000 megaton exchange and nuclear winter. "PEAKING OF WORLD OIL PRODUCTION: IMPACTS, MITIGATION, & RISK MANAGEMENT"
From the Executive Summary: "A unique aspect of the world oil peaking problem is that its timing is uncertain, because of inadequate and potentially biased reserves data from elsewhere around the world." Seems to square with your concerns and comments, Gail. Freddy Hutter tracks past forecasts, including IEA of course, at his TrendLines website, with its famously awful HTML formatting. No, he won't be contributing to TOD - editors banned him years ago for whatever reason. Based on realistic models I can get peak dates of around 2008 with 2700 billion. Matt Simmons claimed in previous years that Fatih Birol privately briefed governments and other important parties on their real findings which differed from the toned down publication. Matt said he'd been briefed by his friend Fatih. Assuming Matt was telling the truth, I wonder if the same thing happens this year and if anyone will take Matt's place and leak the confidential conclusions? I think with respect to this type of agencies, being objective when the studied domain doesn't necessarily bring direct political/economic tension, or when the future looks ok can be attained. For instance if some agency is responsible for evaluating the remaining number of tigers in Asia or Elephant in Africa, they could still be objective. Or for instance regarding the IPCC, I beleive they are quite objective in representing what they think is the truth regarding forcing characteristics of different green house gases, capacity of CO2 sinks, level of current emmissions, gathering CO2 and temperature measures, things like that, subjectivity may come in when they "import" the subjectivity contained in iea predictions in their future scenarios (this not being subjective from an IPCC point of view : they simply take iea predictions as objective input). And with respect to the iea, the historical aspect is very important, as somehow their reports must be more or less coherent from year to year, so if they start slipping in subjectivity (not publishing what they think is the truth)on a year, this can only get worse from year to year. And on this, apparently a major step happened in 98 when they did try to publish a rather objective report, the result being that almost the whole team got fired (on US pressure apparently). There are a couple of articles on this story in Matthieu Auzaneeau's blog, also based on an interview with Robert Hirsch and info from Linonel Badal. Unfortunately the LeMonde blog platform on which it is is kaput right now, will try to add the links and extracts when it is back up. In 1998, the IEA team working on the influential World Energy Outlook (WEO) made a detailed and authoritative assessment about the future of oil production. The team was composed of the world's finest energy experts, amongst whom Jean-Marie Bourdaire, coordinator of the study, Ken Wigley, Keith Miller and the man who would later become Chief-Economist of the IEA, Dr. Fatih Birol. By using confidential databases and sophisticated expertise, they reached a dramatic conclusion: Peak Oil, the moment when global oil production starts its irreversible decline, would happen well before 2020, around 2014. Although the IEA publicly claims to be free of any external meddling, the team was under intense pressure and scrutiny. As recalled by the veteran geologist Dr. Colin Campbell, who advised the IEA on the 1998 WEO, at one point, Bourdaire had to stop calling him from his IEA office as the issue apparently became “so sensitive” that he couldn't be seen in contact with him. Nevertheless, in 1998, the most influential member of the Agency, the USA , didn't like at all what was coming from their study. A structural problem with oil as identified by the IEA team would undeniably question the sustainability of the current economic model. During the study, the IEA team realised the extent to which economic growth was correlated to the availability of abundant and cheap energy. Hence, once oil production would stop to grow and tensions appear, economic growth would become far more difficult to sustain, if not impossible. The IEA team was effectively walking on eggshells. As revealed by Dr. Colin Campbell, when the article was published, “the IEA evidently got into serious trouble” (6). So what happened behind the walls of the Agency? First of all, high-ranking elements of the US Administration got mad when they heard what a couple of European civil servants had done with the 1998 WEO. Coded message or not, what was coming out of the Paris-based agency was unacceptable for them. The kind of structural crisis pointed out in the 1998 WEO was to be buried and quickly. Well, to the great displeasure of the EIA, a few months later the IEA would say and demonstrate the complete opposite. One can imagine how pleased the EIA and its host department, the DOE must have been. A 2006 article on oil production forecasts and methodologies from Dr. Roger Bentley ( University of Reading ) and Professor Godfrey Boyle (Open University) similarly talked of “political pressure of the USA and Canada ” (8)after the publication of the 1998 WEO. Motivated by what can only be described as incompetence and arrogance, elements of the US Administration then put extensive pressure on the IEA leadership. What did they want? The coordinator of the 1998 WEO, Bourdaire, would have to leave the Agency. Meanwhile, Wigley retired and Miller also left the IEA. The IEA team who wrote the 1998 WEO was knocked down and its only “survivor”, Dr. Fatih Birol, who was now in control of the WEO, would learn a lot from these events. Very interesting. 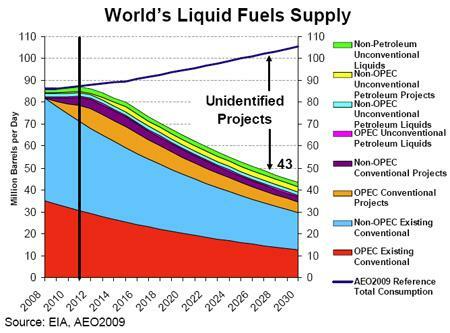 The 1998 forecast of Peak Oil in 2014 could be right; Skrebowski recently picked the same year. There is no guarantee that 2005 was Peak, and we won't know if it was until oil production moves down or up from its six-year plateau. Although the IEA says peak crude production was 2006 and they project it will never reach that level again but bizarrely stay on a slightly lower plateau for the next 25 years. I think it is most likely we are off the plateau "noisy" data notwithstanding. But we shall see. I do expect claimed OPEC surges though. Every year that is not yet a clear and permanent decline is "a gift". the debate is over. it was over a while ago for a minority. •	I remember the IEA whistleblower saying that a “scientific committee” that would supervise the methodology used by the IEA in its WEO was imperative. For him, there was no serious review of the report at all. It is under the exclusive responsibility of the Chief-Economist who can do whatever he wants (or whatever he is told to do…). Some European politicians were briefed about this, but nothing has been achieved (yet). •	From my discussions with officials of DECC (UK Government) and the European Commission (DG Energy), the IEA WEO is just a report, not “the bible”… In short, they were telling me that they read it, but don’t base their policies on it (they claimed to be looking at both “optimistic” and “pessimist” assessments). EC officials were also critical of the IEA, that it never achieved anything… The fact that IRENA was created is also a strong rebuke of the IEA. •	France for example pays far more attention to what Total is telling them (and that’s good). It’s also ironic that an oil company is more honest on Peak Oil than the so-called “global energy watchdog”. Can't refrain from being cynical. TBTB must know about PO. They are smart educated poeple. Obamas and Bernankes of this world must know, But they can't say it loud, because as a result of the panic the bottom would fall off, (Off everything...). Can you imagine what would happen to let's say Wall Street, if someone from the establishment acknowledged the real oil situation in public? The stock market would fall apart within minutes. Humpty Dumpty. And then the rest down the drain, together. Maybe denial is an not entirely conscious effort to create rough landing later on, rather than a crash now. Or maybe I am an optimist and they are simply dumb. The Powers That Be believe EIA, IEA, and CERA; they all say about the some thing--nothing to worry about for twenty or twenty-five years. That is the strong consensus of conventional wisdom. As I've said before, TOD is widely regarded as fringe or beyond the fringe--because we here contradict the conventional wisdom. After all, why believe anything on a fairly obscure website when the big authorities like Yergin and all the others like him says that Peak is not in our near-term future. Politicians and corporate executive usually focus on the present and the next year. In the case of politicians, they mainly are concerned with raising money for TV ads and the next election. In other words, the merely urgent drives out consideration of truly important issues such as climate change and Peak Oil. The post three screens above this one (http://www.theoildrum.com/node/7106#comment-740825) seems to indicate that US Administration knew in 1998. The way I read that post there is no indication whatsover that the President saw the forecast of a Peak in 2014. Somebody on his staff may have known, but one thing that a presidental staff does is to restrict the amount of paperwork that crosses his desk. Because the 2014 date was long after the president would leave office the report may have been considered not urgent or important enough to pass along to the top man. Politicians tend to think short-term--mainly about the next election and how to raise money for it. For a brief period of time I worked for the U.S. government as a data processing systems engineer. Believe me, there is a tremendous amount of knowledge at lower levels that never gets to the top or even the second rung down from the top in the Federal bureaucracy. As I've said before, TOD is widely regarded as fringe or beyond the fringe--because we here contradict the conventional wisdom. So when Dr. James Schlesinger (former Secretary of Energy, Defence and Director of the CIA) says the argument is over and that the reality of near-term Peak Oil is accepted in the corridors of power, that we should class him as "beyond the fringe" and spouting nonsense? Not that he expects anything sensible to be done about the problem. Two years ago, in addressing ASPO, in Cork, Ireland, I argued that the "Peakists" had won the intellectual argument... That Peakists were no longer a beleaguered minority, that they had won, and that consequently, they should be gracious in victory. ...Can the political order face up to the challenge? There is no reason for optimism. We are likely to see pseudo solutions, misleading alternatives, and sheer sloganeering: energy independence, getting off foreign oil, and the like. All of that sheer sloganeering we have seen to this point. The political order, which abhors political risk, tends to rely on the Biblical prescription, "Sufficient unto the day, is the evil thereof." ". The calculation has been that telling it like it is - complete with the prospect of little or no economic growth for a long time and the growing impoverishment of most of the population -- would be at best political suicide and at worst would crash the stock markets leading to instant misery and impoverishment for millions"
You discount him as well? Does EIA and IEA and CERA discount him? It doesn't matter what I think. They are the conventional wisdom. Is it even conceivable to you that the EIA, IEA and CERA say one thing in public and another in private or is that not even a conceptual possibility to you? You are starting to look like you must resist that possibility at all costs. Why not just say "it is possible but I don't believe it" unless you really think that's an impossibility as your posts seem to imply. Do the words "Clear and Present Danger" mean anything to you? It's more than 30 years since a US President went on tv and spoke about Peak Oil. I've watched Yergin a lot. IMO he is not lying; he believes what he is saying. Note that a large majority of economists do not believe that Peak Oil will be serious, and economists have a lot of inflence on governmental and quaisi-governmental organizations--especially on Congress and the President. To lie on the scale you suggests requires a very large conspiracy. I do not believe that very large conspiracies can stay secret. Indeed, the way government bureaucracies are set up, it would be virtually impossible to have a conspiracy with more than about a dozen people involved. Your implied conspiracy would require thousands of people to be in the know. There would be at least several whistle blowers, more likely dozens. Since the publication of "The Pentagon Papers" it has become clear that the U.S. government can keep few if any secrets. Note how the little conspiracy around Watergate was blown out of the water. It hasn't exactly stayed secret though. A former head of the CIA, other ex CIA personnel, IEA whistleblowers, former DoE staff etc, have gone on the record and a current high ranking EIA official (Glen Sweetnam) even produced graphs censored from public versions of EIA documents and spoke about it before immediately being transferred to the control of the National Security Council and muzzled. The US military is even publishing reports concerning near term Peak Oil and preparing for it. Plus the current Energy Secretary Dr. Steven Chu is fully aware of near term Peak Oil and spoke about it prior to taking up his current position. Do you honestly think he's suddenly changed his mind or even worse still believes it but can't be bothered to tell Obama that he is being misled by fools? To believe as you do that they really don't get it suggests that you believe that your analytical capabilities are far better than that of any US agency tasked with assuring aspects of national security. You are entitled to that view but I prefer to listen to Schlesinger, Hirsch, Sweetnam and others who state that those at the top know but don't speak. As I have said before, the conventional wisdom is EIA, IEA, and CERA. Presidents and congressmen listen to the conventional wisdom. For example, has Chu ever publicly contraticted anything stated by the three Authorities listed above? Obviously not since taking office. At least as far back as 2004 he was presenting slides like this. That's Slide 16 - enough of a contradiction for you? In 2005, Steven Chu held the position of director of Lawrence Berkeley National Laboratory, part of the DoE. There Dr. Chu oversaw the work of David Fridley, an expert on the economics of oil who has become an activist in the Transition Town movement. [Chu] was my boss (...) He knows all about peak oil, but he can't talk about it. If the government announced that peak oil was threatening our economy, Wall Street would crash. He just can't say anything about it. Q: - What happened after you published your 2005 report on ‘peak oil’ for the US Department of Energy (DoE) ? Q: People that were high in the administration hierarchy ? The people that I was dealing with were high in the laboratory level. They were getting their instructions from people on the political side of the DoE, at high levels. Q: That was in 2006, under Bush administration. Has anything changed with the Obama administration ? It has not changed. I have friends who simply won’t talk about it now. So I have to assume that they are receiving the same kind of instructions. Q: Yet in an interview he gave me in March 2010, Glen Sweetnam, who was heading the publication of DoE’s annual Energy Outlook at that time, admitted that « a chance exists that we may experience a decline » of world liquid fuels production between 2011 and 2015. Less than a month later, he was transfered to the National Security Council, where he is now under direct authority of the White House. Were you surprised by his statement ? Yes, I was very surprised by what Glen (Sweetnam) said, because everything in the DoE is very controlled. Glen must have gone ahead and done it, and nobody reviewed his remarks. Q: When I asked Secretary Steven Chu and the political staff of the DoE to comment on Glen Sweetnam’s statement, they replied with a « no comment ». I think it would be very difficult to get any more information on this. Now that Glen Sweetnam is at the National Security Council, it’s like he’s not in the circulation, he’s not going to give any public presentation anymore. Q: Yet it seems like Steven Chu, Obama’s Secretary of Energy, is aware of the ‘peak oil’ issue. With all due respect, I disagree with Robert Hirsch on a "conspiracy of silence." I've studied enough conspiracies in history and in sociology and economics (Oligopolist conspire). The overwhelming evidence I've seen is conclusive: Large conspiracies cannot keep secrets. That's why all the nutjobs who ramble on about the Illuminati are all wet. There is no way that such a conspiracy could last more than a week or two. OPEC, which is just about twenty (?) conspirators can't even keep its secrets very well, though KSA does do a good job of keeping its excess capacity as secret as they can. Even so, Rune Likvern and others have come up with pretty good estimates of KSA excess oil production capacity. Large conspiracies cannot keep secrets. The "Manhattan Project" was a large conspiracy that was kept secret for a long time. But please, don't tell any one. Let's keep that between you and I. That's why all the nutjobs who ramble on about the Illuminati are all wet. Hey, as an Illuminati Special Ops Field Agent, according to the badge I bought at a shop in Edinburgh about 30 years ago, I resemble that remark! The Illuminati is actually run by Steve Jackson Games but don't tell anyone. "To lie on the scale you suggests requires a very large conspiracy. I do not believe that very large conspiracies can stay secret." That's because it's not a conspiracy, per se. It's called propaganda. And yes, it operates quite frequently at the scale which challenges your credulity. The Nazis are an obvious example of a propaganda state, there are innumerable others. In fact, American puts Nazi Germany to shame in this regard. In this case, as in that, it's not agitation propaganda, but integration propaganda. Americans really would do well to think a lot more deeply and study much more history - they're so naive and superficial in their faith in their authoritarian-corporatist State posing as a kindly old gentleman handing out favors and doing 'the people's work' - the US public school system is to blame, I suspect. Television, as well. What Hitler or Stalin wouldn't have given for TV!!! At any rate, I suggest Jacques Ellul's 'Propaganda: the Formation of Men's Attitudes' as a primer on the subject. Perhaps, if you can set aside your preconceptions, it will inform you. Perhaps not. I buy into propaganda as a major political force. Hitler thought it was the most powerful of all forces and blamed German defeat in World War I on superior British propaganda. He may well have been right. In both World Wars the British propaganda was the best in the world, clearly superior to German or Russian or American propaganda. Also, I'm a great fan of George Orwell and used to write papers on him. And astonishingly we've done it again by successfully convincing the world that our oil and gas production is in free fall, we struggle to keep the lights on in winter and that we are totally screwed. When in fact the reality is. Oh, wait that is the reality. Phew, I nearly mentioned that 150 billion barrel field under Balmoral Castle but I think I got away with it! The BBC mini drama "Burn Up" was based on the premise that various agencies cover up Peak Oil following the lead of the US PTB and their claimed belief that "everything ends tomorrow" if the truth is revealed. In the end the truth is revealed in the tv show against the will of the USA and news bulletins show stock markets crashing and unrest throughout the world. Then the last scene moves to one year later, The main characters are at home bringing up a child. Normal tv programmes are running in the background on the tv, there is busy traffic outside on the roads and the world is getting on with attempting to deal with the problems honestly. If you were a President and your National Security Adviser told you one morning that astronomers had determined that a 100 km diameter asteroid was due to collide with earth in a year's time, would you disclose it to the public? If I were president and got that news I'd immediately order at least a dozen cases of the finest French champagne. But I do not think your anology works. Most presidents are not interested in long-term concens--unless they are pushed by the military. It may be the Pentagon that forces Congress and various presidents to face the facts about Peak Oil. But to everybody in the establishment, the "facts" are what IEA, EIA, and CERA say are facts. What we say is merely fringe opinion and not to be taken seriously or even noticed. I wonder if anybody in the federal government reads TOD. I rather doubt that. Given the below text posted by a TOD reader I'd say that doubting the lack of ANY readership of people employed in FEDGov is a poor doubt to have. there is a tremendous amount of knowledge at lower levels that never gets to the top or even the second rung down from the top in the Federal bureaucracy. The "Carter Doctrine of Elections" is considered 'wisdom' - if you tell the public honest bad news you'll get booted. Personally I think the reports hide the truth, in plain sight. When looking at the key graph page, the "World Oil Production by type" graph sticks out like a sore thumb. The "fields yet to be developed" category shows production of ~8-10 mbbls/day in 2015 rising to ~30 mbbls/day in 2035. These fields are not to be confused with infills in existing fields, yet they are already discovered, just waiting to be developed. In 4 years and 2 months time, when an equivalent of Saudi production has not come to fruition from these fields, it is not the IEAs fault, it is the oil companies and the governments that did not invest the sums to make it happen that failed, not the IEA prediction. Is it not the job of the “global oil watchdog” to inform its member states and citizens (who by the way finance the IEA...) that a major oil crisis is looming? Should we allow them to hide the truth, publish misleading report and misinform everyone on a vital issue? They have told their paymasters. Their paymasters have told them to STFU. You expect to be told the truth from the corrupt, sociopathic power-masters intent on global war and their idiotic, elected "poodle" politicians? No I'm not joking, but perhaps I didn't explain myself clearly. The IEA will be able to show in future reports that what was in the 2010 report did not happen because of lack of investment. They can point to the graph and show it was an 'honest' assessment at the time, yet it did not happen. Everyone seems to be taking that graph and the report as BAU, whereas I see it as a clear sign that they know the gig is up and are telling their masters such. The graph clearly shows that existing fields are going to decline by ~10 mbbls/day between 2010 and 2015. "China will continue lead the charge as the No. 1 energy consumer over the next quarter-century, and oil will remain the dominant fuel despite huge investment in alternatives, according to a International Energy Agency report released Tuesday. The agency forecasts that China's demand will soar by 75% between 2008 and 2035, compared to an overall surge of 36% in international energy use." (later on) "As a result, the price of oil is expected to increase to $113 per barrel in 2035 "
Demand goes up by 75%, and price only goes up 30% while supply drops? yeah, right. The other funny was the menu on the cruise ship was down to Spam and pop tarts. That would be an interesting sandwich combination. You would think they would have enough canned goods or MRE's or C-rations or something to feed everyone for the DHS recommended three day emergency or so. But no, they didn't. I suppose if they did the CEO wouldn't be able to afford the new Gulfstream model coming down the pipeline at $65 million a pop. Thanks Gail, that is great. For several years, I have been disappointed with the degree of candor from both IEA and EIA in forecasting future oil supply. I always figured they worked out expected demand and entered a supply figure to suit. After all, I reckoned they couldn't make the same kind of errors, year after year after year without their credibility taking a hit. Then I found that they must submit their reports to the USA for authorisation prior to publication and that there is a high degree of frustration within the IEA at the degree of editing. Now I have worked out which parts of their work to have confidence in and which to not. Can the IEA really be expected to be objective? Can someone from TOD criticizing the IEA's objectivity be expected to be objective? Given the current structure and objectives of the IEA, it seems like it would be very difficult for the IEA to be 100% objective, especially in making forecasts where there is a high degree of uncertainty. Given the ideological predisposition of the majority of people on TOD, it seems like it would be very difficult for most article-writers for TOD to be 100% objective, especially in making forecasts where there is a high degree of uncertainty. Of course nobody is 100% objective or even close to that. The closest we can get to truth is through free and open dialogue, such as we have on TOD. Both Socrates and Plato believed in the value of dialogue, and I think they were right. Over time the limitations and biases of various article writers and commenters becomes rather clear. For example, Gail was educated as an actuary; she thinks like an actuary. If she had been educated as an economist or a sociologist she would have other insights and limitations and perhaps biases. The closest we can get to truth is through free and open dialogue, such as we have on TOD. Keep in mind there are also accepted 'legal truths'. Sworn statements, court records - things like that. Rarely does that class of 'truth' get directly posted to TOD - if a court case is referenced it is via some other person making a comment on the case in their work. Really, most everything here on TOD would be hearsay in a court. How frequently does anything approaching truth get found out in the courtroom? There's the old joke about the Junior Lawyer running in from court to breathlessly announce to his Senior Law Partner: "The verdict is in and justice has been done." To which the elder lawyer replies: "In that case, we will have to appeal!" Yes. people here peddle concept of PO :-)...But there are a few differences. People here will accept being proven wrong (only hard data will do, though), and nobody censors anybody. And we know that we are right ...just because oil is a finite resource. I don't think it has anything to do with objectivity. The problem is that no one on that side of a fence has a realistic model for oil depletion. Ask IEA if they have a model. They obviously don't otherwise they would have referenced it. What they are essentially trying to do is solve the equivalent of an electrical circuit's impulse response without having any knowledge of Ohm's Law. So it has nothing to do with objectivity and everything to do with having any skill in analysis, starting with the laws of probability in drawing resources from a finite supply. That is my idea of a model. Speak for yourself. All my models are based on probabilities and always have been. How do you model uncertainty? It's called probability, otherwise known as the logic of science. Agreed. Probability including Bayesian statistics. Yes, that is the fine point in a good analysis. You use the model against all the previous data to calibrate, which essentially sets up the Bayesian prior. This gets updated continuously as more data becomes available. I really doubt that IEA is doing anything close to this level of sophistication. Anyone who thinks himself "100% objective" is fooling at least one person ... himself. When modelling systems involving human behaviour, the choice of elements to put in the model is based on an internal, partly unconscious set of beliefs about human behaviour, which in turn is socially determined. Your "dispersive discovery" model is a good one, the most sophisticated and economical model I have seen for this subject, but it can't cope with sudden changes in human values. It is this kind of uncertainty--what will most people believe about the use of oil in ten years? how will that affect their actions?--that can't plausibly be ascribed any a priori probability. Just like the "computer VS the daily news" problem in predicting the stock market. Money, stocks, etc are proxy measurements for some other measures, some speculative, others based on subjective worth. I can understand how it is hard to model the stock market. On the other hand, quantity of oil is a concrete measure that is amenable to all sorts of straightforward analysis. Yes there could be other behavior pieces that layer on top of this, but it is beyond belief why no one has tried to work some basic math on the discovery and depletion numbers. stocks, etc are proxy measurements for some other measures, some speculative, others based on subjective worth. I can understand how it is hard to model the stock market. And yet, 70% of the stock trades are held for an average of 11 seconds. So either someone has a working model or the market is rigged with the insiders having an advantage over the outsiders. I guess running a con job is A TYPE of model - so there is an existing model. It just isn't what one is told in econ classes. It's a market efficiency model. This is very important to consider. If everyone had access to the same investment model, no one would make any money, because it would be zero sum overall. So the only wzy to make money is by doing it faster. Computing technology is the only discriminator then. Stock market price correlations are at 70%, the highest ever recorded, likely due to the trading algorithms flattening the differences between individual stocks. Modeling of oil depletion suffers from exactly zero of these game theoretical concerns. Just like the "computer VS the daily news" problem in predicting the stock market over any humanly meaningful time-frame. Make a bet. Buy a stock. Stock goes with bet: hold. Stock goes against bet: sell. Positions are held for eleven seconds, on average. There is no "market evaluation of worth". There is no worth added to the public good. Value is simply extracted. In terms of oil, this would support the idea that the money will contract to the concentrators of wealth at the first sign of negative trends. Perhaps we should all just walk nonchalantly away, whistling. "Good report. 100% accurate. No oil problems for decades!" "trying to do is solve the equivalent of an electrical circuit's impulse response"
Digital signal processing, yes? Z-plane S-plane can't complain? I don't know exactly what you re referring to. I suggezt that they simply solve the problem using laws of logiic, say something akin to the mass actiion law. Agree that the issue here doesn't really relates to "objectivity", it simply relates to "honesty", and the title should be "honesty of the International energy agency". Indeed the problem isn't that the IEA would use some subjective judgement to make its evaluations, these are evaluations in any case, and the KSA level of reserves for instance, even for the IEA is most probably bound to contain some guess work. The problem is that the IEA doesn't write what they think is the truth to the best of their knowledge, full stop. Wouldn't be suprised that the average IEA guy is as "scared" as the average TOD guy about peak oil and its effect ! Do all the good hearted Americans here, truly realize that the CURRENT American consumption is still higher than the ones of : China, Japan, Germany, Russia, and India, COMBINED !! Ultimately it comes down to one man at IEA that Bush appointed one month before leaving office. Anyone know anything about him (beyond his IEA CV)? issues ranging from Middle East politics to trade negotiations and energy security. Kazakhstan (1998-2001) and Lebanon (1996-1998). He also acted as the U.S.
the Presidency on the Baku-Tblisi-Ceyhan pipeline and other critical energy issues. as Economic Policy Advisor at the U.S. Mission to the OECD. CA, and an MS and PhD in Business/Statistics from the University of Wisconsin. Russian and German. He and his wife Joan have four children. Wow. Thanks for the info. I had no idea how shady Richard H. Jones is. I wonder how long his term is? Can Obama replace him? Interesting comments by an expert about the deliberations of other experts. Nothing new, no stress to experts, but the layman can experience concern when experts disagree or even have worthy disputes. A jury trial is a case in point where experts often take opposite positions. In all disciplines some (often many) experts can be bought. This happens all the time in jury trials. And of course expert appraisals were bought by the tens of millions in creating the huge mortgage debacle.